St. Martin's Griffin, 9780312354985, 352pp. When Carlisle Wainwright Cushing, of the old-moneyed Texas Wainwrights, moved to Boston three years ago to work at one of the city's most prestigious divorce law firms, she thought she had escaped the high society she'd grown up in – after all, no one in Boston, not even her fiancé, knew she was an heiress. But now, Carlisle has been lured back to Texas to deal with her mother's latest divorce and the family-sponsored 100th annual debutante ball, which is on the verge of collapse. She's afraid she'll never get back to Boston, at least with her reputation intact, especially when good 'ole Southern boy Jack Blair shows up on the opposite side of the divorce court, making her wonder if he's going after her mother in the proceedings--or her. Carlisle's trip home challenges her sense of who she really is and forces her to face her family's secrets. 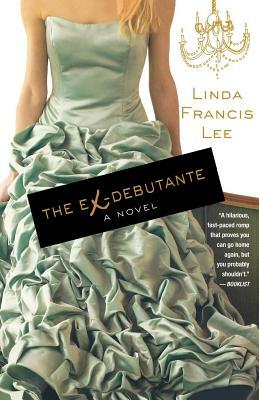 Funny, smart, and poignant, The Ex-Debutante is a story about the risks one woman must take if she stands a chance of finding herself, real love, and her place in that crazy thing we call family. LINDA FRANCIS LEE is a native Texan now living on the Upper West Side of Manhattan, steps from the Dakota Apartment Building. Linda's writing career began in college when she published her first article. But after graduating she was sidetracked from writing when she was offered a job teaching probability and statistics. Later she found her way back to her first love, and the Atlanta Journal Constitution called her breakout novel, Blue Waltz, "absolutely stunning." Now the author of more than twenty books that are published in sixteen countries around the world, when Linda isn't writing she loves to run in Central Park and spend time with her husband, family, and friends.